Hi Bill, what is HDU board? I hope not the same as MDF?! HDU = high density urethane. A closed cell rigid foam board. Ok. Got it, stuff like Divinycell. I reckon a stiff dingy is far superior for rowing than any inflatable. a good bit of keel on aft sections help them track. I am planning a 2ft bolt on extension in epoxy ply to the stern of our 8ft pram.... as a completely sealed unit it will provide, length, buoyancy and speed to the boat. I don't think I would ever rely solely on an inflatable. i do have one on board though when cruising so multiple crew can get ashore independently. If I were to make another, would increase the freeboard slightly to make rowing easier. This. Reading through the thread, this is what I was going to post. I have a Spindrift 10N and like it very much. The only downsides are the freeboard and weight, IMO. It will carry a huge amount of provisions, due to it's displacement, but when loaded down you have to be careful about tipping. Bashing through a choppy anchorage can also be a wet ride. You learn to "trim aft" raising the bow a bit, that helps. I also have a sail kit, and when sailing, you have to be real careful not to dip a rail. I think adding 3-4" would be a lot, I would think 2-3" at the most but more might be fine. Be careful about how it will nest with additional freeboard as well. Also, consider that if you are planning on storing it on deck, any added freeboard will make is sit higher. All in all, if I were building one, I would take a hard look at adding freeboard. Other things I did. I added a SS rub rail down the keelson. Gives a good surface for dragging it around or rocky beaches and such. I also reinforced the cutwater and side and aft chines with woven fiberglass and covered the hull with resin below the waterline. The boat is crazy solid. Two years ago, I hit a rock hard in Southwest Harbor Maine. Knocked both me and my wife off our seats. (Don't cut corners in Maine, even on a dink.) Boat was fine. Couldn't even find the mark from the hit. Jammer is right about them not being convenient for hauling on deck and joining/separating the hull halves. Think of joining and separating the hulls as more of a strategic, rather than a tactical decision. 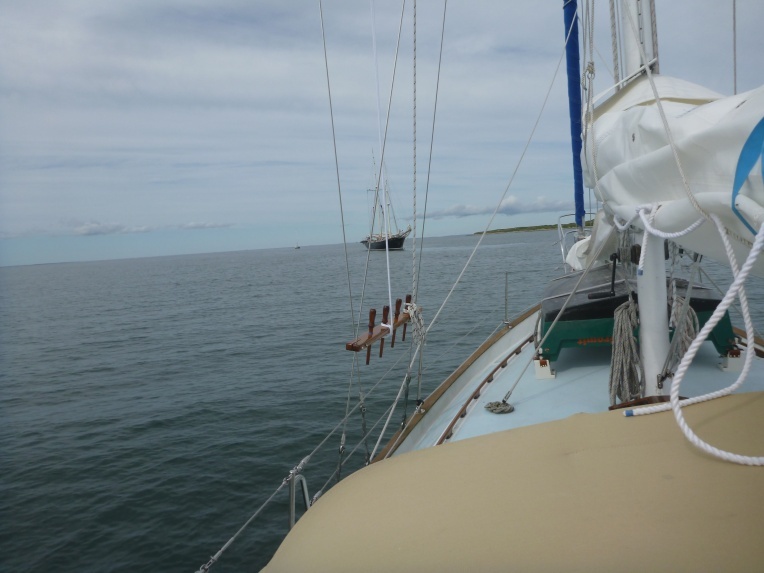 I have a set of chalks that I bolt in to my deck for storing the dinghy there, with bow nestled in to the stern. I only do that for offshore sailing and winter storage though. Getting the dinghy up on deck, hulls separated and secured on the chalks, takes about an hour of work. Not what you want to do every morning at anchor. 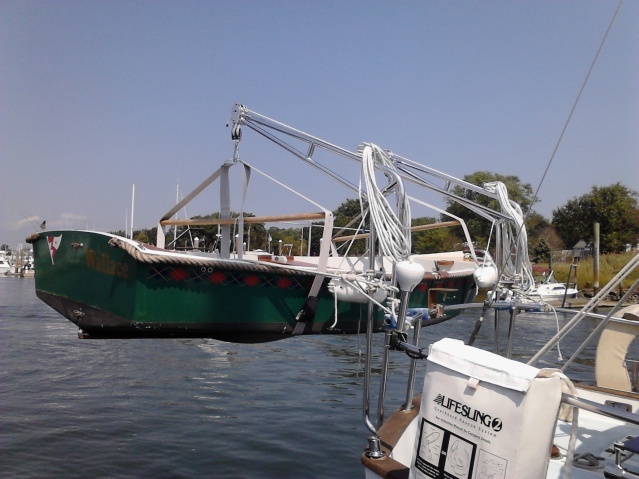 Most of the time the dinghy lives in davits like any other, non-nesting, hard dink would. Oh, one more thing. If you are building a Spindrift to accept the sailing kit. Make two daggerboards when you make the sail kit. 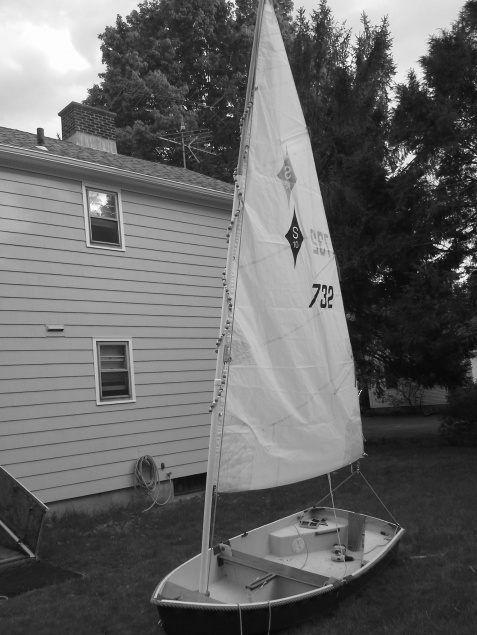 One full length to actually sail with, and a short one that you'll use to plug up the daggerboard slot. If you are pulling the dink behind you, water will percolate up the daggerboard slot and slowly fill the boat with water. (Ok, maybe three downsides to the Spindrift, but every boat has issues). Plug it up and you're all good. "Downeast Yachts - More sailing per mile since 1975"
Another option is "Nester" designed by Dave Gerr. It's a bit bigger boat, will carry 4 adults. Plans are free, there is a chapter on the boat in his book "The Nature of Boats" which I highly recommend, a very good and useful book. Dave Gerr is head of the Westlawn Institute of Yacht Design and owns a yacht design business. He knows his stuff. At last the "Spindrift 10 à la Laser" had its first trial sail today. Broke the temporary tiller and will replace the forward hatch by a yacht hatch (the current one was a trial. Apart from that all works. Engine, rowing and proper dinghy sailing. As an extra there is a huge forward deck locker to ferry stuff dry to Lady Rover. Two weeks building time. Finishing to follow. Nesting dinghys are time consuming to stow and deploy. They are a necessary evil on pocket cruisers unless you are willing to have an inflatable boat and deflate it when not in use. But no one who has one finds them convenient. I would rather have a roller furler than a nesting dinghy, if I had to choose. If you're going to adopt a cruising style that involves frequent use of anchorage and mooring, you'll want a dinghy that is convenient and practical. It doesn't have to be time-consuming to stow and deploy. I have a Chameleon nesting dinghy. I just pick up the 2 parts, chuck them in the water, jump in the stern half and bolt them together. Honestly, it's a 5 minute job, if that- about the same time it took me to get my old inflatable off the deck. An advantage is that I can deploy and retreive the nesting dinghy without any assistance. Each half is under 20kg. One of the undeniable advantages of well designed hard dinghy is the ability to row it. Under oar power, it is fast and effortless to cover longer distances. A sailing rig is also nice (I didn't build mine with the sailing rig). I agree, it doesn't take that much time to assemble the nesting dinghy. We don't throw our halves in the water (but may have to try it) to assemble, but on the aft cabin. Would say no more than 15 min and this is including removing offshore stowage straps, launch and ready to row. Assemble time when we carry on the fore deck is a little shorter/easier, as we don't have to dance around the mizzen standing rigging (that's specific to our boat). We do have a roll up hypalon inflatable that we carry down below completely deflated. It does take more time to inflate it than assemble the nesting. Each has it benefits. Hard dink tows/rows better and is much faster w/the same payload w/the 5hp motor. We also have a d/f transducer glued to the hull inside a seat to map out areas which is especially helpful if we go aground. In rougher conditions the inflatable is drier. The nester is more rugged, can be dragged up on the beach or left against some nasty pilings and we know it will be fine. While we don't have any leaks in the inflatable now, but we have seen too many cruisers administering inflatable CPR every morning which seems like a pain. If/when our nester ever dies we'll definitely make another one. I guess if you've never had a nesting dink then maybe it seems impractical but for us is a much better dink and better deck storage space than a RIB.